Remote Controls used in our homes are the counterpoint of our attention, who is not handling them on a frequent daily basis. Considering the importance we assign to the remote controls I am surprised how little attention they got over the past many years from designers. Our RCs look today, besides some slight variations of shape and color, like they looked in the stone age of technology. Why not giving them a make over like Didier Hilhorst and Nicholas Zambetti at Droog Design did in 2007? The designer duo created the Cushion Control, pillows that function as remote control for TV or any other stuff we sue to control in our electronic portfolio at home. The idea is fabulous, using cushions that are often place for decoration on a couch or in our bedroom. The Cushion Control gives an added functionality in a playful way and as the designers anticipated in this concept design to ‘transform the fights over “who has the remote” into playful cushion fights’. 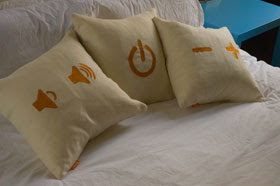 Each cushion has only one function like volume, channel flipping or on/off. Cushion Control was created for Dry Tech III, the third collaboration between Droog Design and the Structures and Materials Lab at TU Delft, which focused on advanced materials and manufacturing processes as an inspiration for design. Unfortunately this cute remote control design did not make it into a commercial product up to now, maybe humanity is not yet ready for a make-over of our work-donkey-style R/C we grew up with.